The blog has been heavy-handed with somber musings so today I write about the cute, cuddly and feathered. You’ve previously been introduced to our dogs and cats, now meet the critters! This is Aunt Bea, a senior Cockatiel. When we originally rescued her she was estimated to be in her teens and that had to have been about 5 years ago. We know she’s an old-timer. Her feet are withered and crumpled due to arthritis but she still dances a jig when she gets excited. She has a special needs cage to allow her to get around without too much fuss. When her partner, Andy died last year we were afraid she wouldn’t be far behind, but she’s still kicking. In fact, I pulled an egg from her cage today! She’s a feisty old lady and quite pleasant to have around. Bunnies have been part of the family for many, many years. We have a nice, safe set up for them but they aren’t the cuddly pets some people may think. They’re prey animals so they don’t appreciate being held like a cat or dog. They think everything is going to eat them. Ours are litterbox trained and love munching on greens. The brown male (neutered, of course) is Hugh. He did have a Hef but she passed away a few years back. He came from the feed store – I tore him from the grasp of a demon child and brought him home. He fit in the palm of my hand. That was over 5 years ago because shortly after the 3 hurricanes hit. After Hef died I felt he needed a friend so home came the other two (also from the feed store.) I don’t condone buying them this way but… the other two are Lionhead bunnies and were a fad for a while. Fads fade quickly and these two weren’t selling. The guys at the feed store gave me a deal and so Hotcross and Sticky came home. They’re sisters. Dorothy the Dove is a pure love. She was from animal control, taken from a hoarding situation. All the big parrots got adopted quickly but no one wanted the little dove. She’s one of my favorites. She’s gentle and sweet and makes the coolest cooing sounds. She’s also laying eggs, it’s definitely springtime around here. … where there’s a will, there’s a way! Meet Eggtooth, son of Dorothy and Felipe. Pretty boy, isn’t he? I hand-raised him after it was evident he was going to be killed by his father if allowed to stay in the nest too long. The star-crossed lovers were separated (much to Dorothy’s delight and Felipe’s dissatisfaction) and Eggers became my favorite helper. That is, until he matured and turned on me. He and his dad are aggressive little buggers! They’d kill one another if given the chance. All live in their own, separate cages and the noises they make are delightful and entertaining. This stunning beauty is Jezebel, an Orange-Winged Amazon. She must be over 10 years old by now. I was taught to syringe feed her and we formed a tight bond. When she was little she would shower with me and we’d sing “Singing in the Rain”! She’s funny and independent. She only says a handful of phrases but she gets her message across. We were having a cold snap when American Idol began this season so she was living in the tv room for a while instead of the back porch. You should have seen her light up when the contestants would start singing! She also loves to imitate sounds like the microwave and phone. Nambu is a Bronze-Winged Pionus and is just a bit younger than Jezebel. They’re friends but have their own big cages. She was in a couple homes before we got her. Nambu is much more sensitive and doesn’t like change. You can see where she plucked her feathers out when she had to come in from her big cage for the cold snap. First night in her entire chest was plucked. She doesn’t talk but will come over for a head rub. She loves to get baths and puts on quite a show when it rains. She’s stunning to look at, her coloring is amazing. 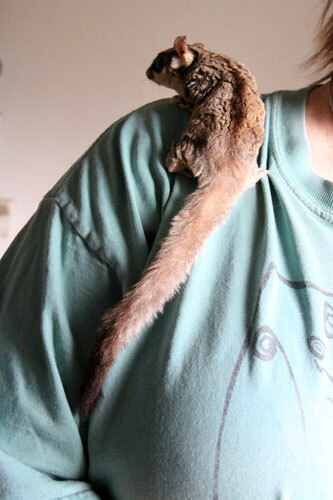 Last, but certainly not least, is our Sugar Glider … Pica. What’s a Sugar Glider is our most asked question. She’s a marsupial, which means she’s nocturnal, has a pouch (like a kangaroo) and has “hands”. Pica lost her mate, Pixel last year but she seems to be managing without him. He was 13 years old when he passed. She’s been with us over 10 years now. Pica came from a school teacher who didn’t have time for her anymore. She’s sitting on my shoulder in this shot, she’s tiny enough to fit in the palm of my hand. They’re really not the right pet for just anyone. They’re fragile and super fast. They have specific diet and caging requirements. Read up before getting one, people.